Today’s post is about preserving fresh coconut in couple of ways. We use coconut in our cooking for most of the kurmas as a paste and grated form for the Stir fries. Since we get coconut for pooja, invariable about two coconuts are always available. We have seen that storing as such along with the shell makes the coconut to change colour and also very tough to remove and use. I have already posted on Coconut paste which is always stored for making gravies. However as a ground coconut stored in the fridge will not be fresh. If the coconut is ground without adding any water and not touched, it mostly stays for a week or otherwise the shelf life is only about 2 -3 days. After seeing that so many coconuts are going wasted, plus the fact that in the rush hour it becomes extremely tough to grind, we thought we should freeze it in cubes for easy usage. 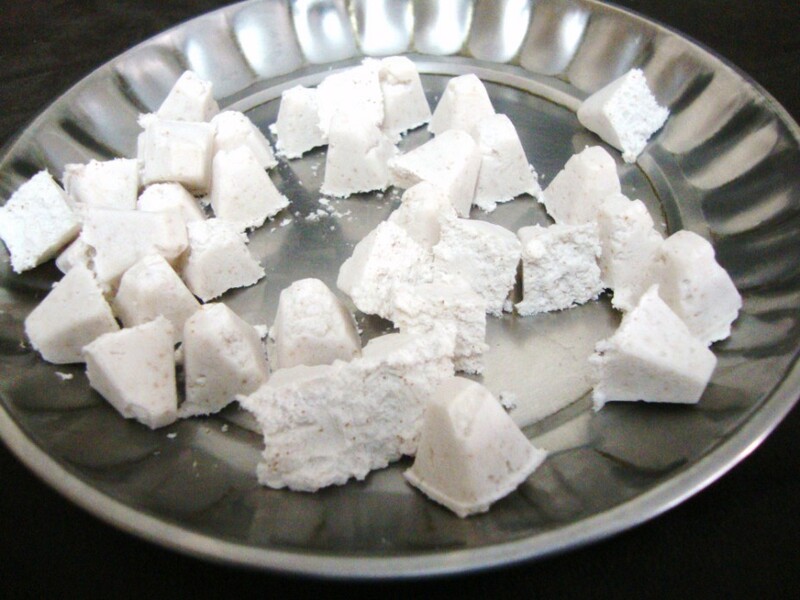 Then Athamma decided she could even grind poppy seeds along with the coconut to make it even better. So the cubes you see is actually poppy seeds ground along with coconut. When stored in individual cubes, while making the gravy we will simply take the required number of cubes and add to the gravy. There is no need to thaw or defrost. Simply add it directly to the gravy and simmer till the coconut loosen by itself. If you want to add poppy seeds or any other masala, you can combine it along with the finely chopped coconut and ground. 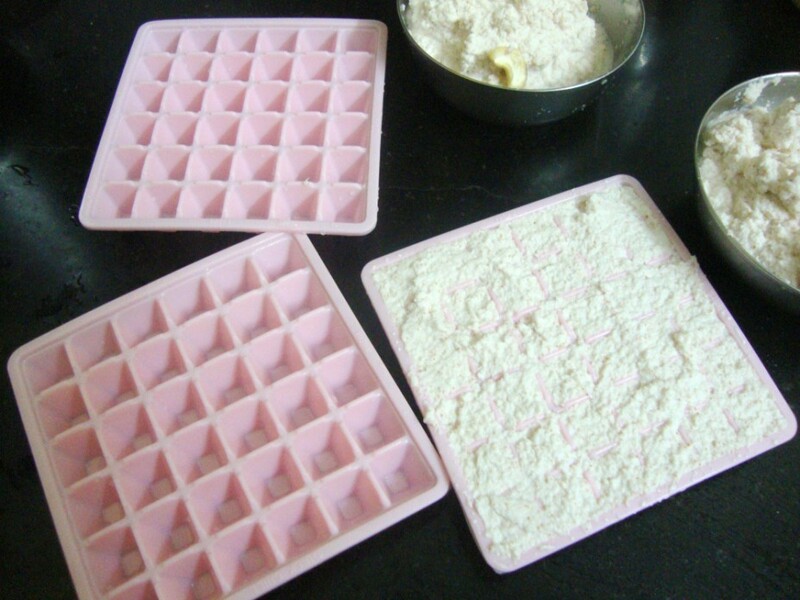 Fill in the cubes tray with the paste and freeze. Once the paste is frozen, remove from try, break into individual pieces and store in a zip lock cover in the freezer. Use it in your gravies as required. Next came the grated coconut. Now not only was grated a pain, grating a small amount was a tough thing to do in the rush hours. Plus as I said we always had excess coconut on hand and never knew what to make with it. Making coconut barfi was the last resort. We also do that occasionally as kids like the barfis that Amma makes. But again this can’t be done frequently. So Athamma decided that only way of storing the excess coconut was getting it grated and freezing it. 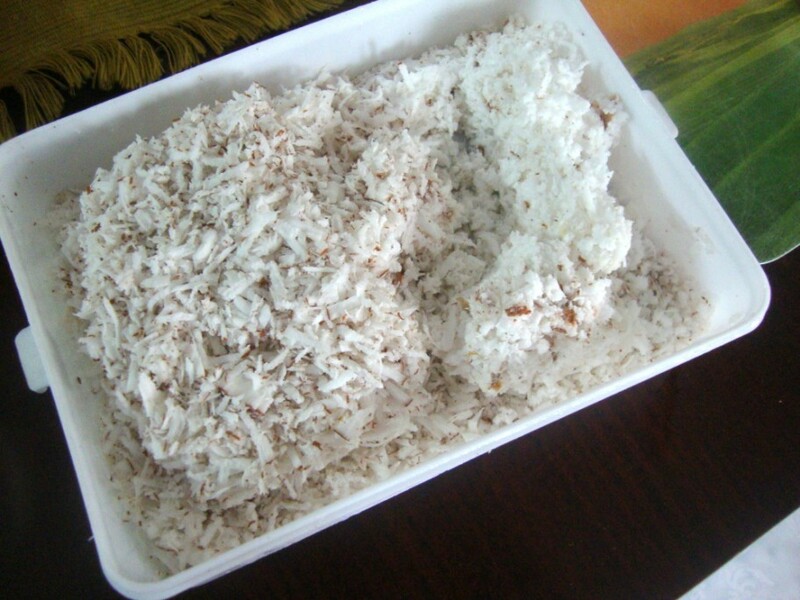 The grated frozen coconut stays white and fresh for many months. I haven’t actually tested the shelf life but I know there is endless boxes of frozen grated coconut at home. I was so happy when my friend told me that this is a fantastic idea that helps her so much these days for her cooking. She uses grated coconut for all her dishes yet she was finding it difficult to grate everyday. She was overwhelmed knowing this way of preserving fresh grated coconut and said she is eternally thankful to Athamma for this tip. I follow the freezing method and it lasts for months. Nice informative post Srivalli. This is very helpful. Thks for sharing. Very healpful storage process. Thanks dear for sharing this post. The frozen cubes is a very useful idea and thanks for the tip. As for the grated coconut, even I follow the same way. It is very easy to use in side dishes when we have it ready.. I do the same way too both with coconut and ginger garlic paste,its quite handy na..
wow very useful post dear…..always do it! Luv'd this post…The problem is faced in morning rushing hours as u said..I jus place my broken coconuts in freezer..Luv the cube idea,it comes handy too.. Helpful post..thanks for sharing the idea..
Love the cube idea Valli.. I also resort to freezing coconut. When I have too many things going on, I just slice the coconut and freeze the slices. We have always been resorting to freezer if excess available !! our cuisine does not require much of coconut..so normally we buy it fresh ,but must say very good tips..infact I recently spotted frozen grated coconut in a supermarket,was hesitant to buy was wondering if coconut after freezing wud not have a typical smell!! Thanks so much for these tips! Very very useful. I am married to a South Indian and I regret the fact that I am unable to make anything with coconut too often. In the past, I tried to use frozen ground coconut for chutneys. But somehow, when I used to put them in the mixie with other ingrdients (to many the chutney) the coconut used to split. Doesn't this meant that it is spoilt?? Please let me know. Thanks! Anon Thanks for dropping by, glad you liked the tips. Personally I have not had the need to store coconut for making chutney. I have seen it split when the coconut thaws and when used directly in mixer, or cooking. It may not be spoiled rather the composition changed. Will check out and let you know if I find a method to use this way.